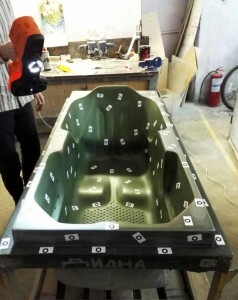 REVERSE ENGINEERING: HOW TO MAKE A BATHTUB? Did you ever think about how bathtubs are made? Well, we’ve recently found out. Our client, Triton LLC, a Russian tub and Jacuzzi-maker was struggling. They produced almost two hundred models of bathtubs and each one had its unique shape and size. Moreover, each model had its own “matrix”, which in bathtub lingo means “master shape”. This master shape was used as the base around which acrylic sheets were spread and then cooled to create a perfectly smooth and beautiful bathtub. The problem is that these matrices, made out of aluminum or composite materials, are meant to only last approximately 3 years (to create up to 8000 identical bathtubs). With time, they erode, crack and wear out, which causes imperfections to appear in the final product. Once that happens, it’s time to create another master model, which can be extremely problematic since replicating complex curvatures of the design by hand is almost impossible and no CAD drawings exists. Triton technicians called us in to help reverse engineer all of their matrices, so that three years from now, they will not have the same issue. What used to take Triton engineers on average 7.5 days before, now takes 3 hours (from scanning to a CAD drawing). To digitize these matrices, we used the Thor3D scanner and large, sticky markers (11mm in radius). We tried to scan the whole object in one go, which took approximately two minutes, but in order to walk around it, we had to move each one to the center of the workspace, which proved a bit cumbersome, as these matrices weighed quite a bit. Another challenge was sunlight. The warehouse where all the master models were stored had large double doors which were wide-open and the sun was shining directly at us. We quickly realized that the doors had to be closed, as direct sunshine is a real challenge for a white light scanner. After scanning: data converted to .STEP format using a special plug-in in Solidworks. Final data will be used to create new master forms for bathtubs and Jacuzzis.